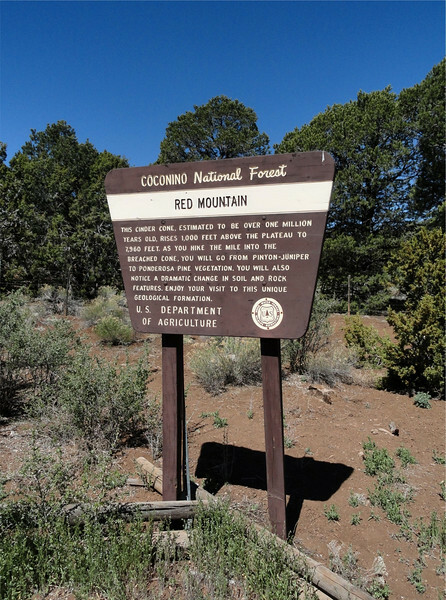 This place is located about 25 miles NW of Flagstaff AZ along Hwy 180 on the way to the Grand Canyon. I happened to read about it in either an Arizona Highways magazine or in the Exploring Arizona section of the AZ Republic newspaper one day. It sounded really neat, but was too far away and too short a hike to do by itself. Sooo, when the annual Grand Canyon hike came up this year I suggested it to some of my fellow hikers. A few of them were able to join me on Sunday, after the Grand Canyon hike, on our way back to Phoenix. It was worth it!! Once we reached the inner area of the old "volcano" we encountered some cool, almost off-worldly looking landscape...from the cinder cones at the beginning of the site, to the "flowing" and eroded lava rock further in. Would have been fun to do more scrambling among the formations, but we didnt have a lot of time, and I personally was having knee and foot problems...so we'll definitely check this out again sometime when we have more time! !